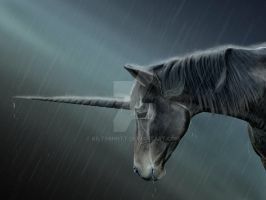 El Alicornio (El Unicornio): Western European (primarily in Cantabria, Northern Spain). This unicorn has wings on its hooves. They can fly. They are mean and carnivorous in many of the stories. Character Information: This is an RPG character. This guy has a mean attitude. he bites. he's very fast. he loves to race. He'll breed to anything. Best in the hybrid art and horseart games. This magnificent unicorn can not be tamed. He rarely submits to any bridle or saddle and he is hard to catch. His speed is nearly unmatched and he can race along the ground with his wings flapping on his feet and it can cause him to fly. Trades/Gifts to Me! * Trades/Gifts from Me! The Art of Stephanie Small is a complex blend of mythical and real. This is your personal invitation to enjoy a tour through the magical and mundane. See a breathtaking visual tour of ancient times and lands filled with trees, magical mushrooms, foliage, enchanted animals and awesome wizards. Let the splendor of unicorns, dragons, griffins, fairies, horses, the winged horse, Pegasus, and even the lone wolf lure you into a world of artistic exploration. Jump into a magical world! There is something beyond fantasy here. This is a mystical land just for you. If you like something real or mundane, Stephanie creates stunning domestic and wild animals. She studies biology and has a love of the ocean and wild animals. Horses, wolves, foxes, ponies, deer, dogs, cats, panthers, lions, fish, tigers and other creatures are some of the animals she draws. She has done animal pet portraits and is available for commission by emailing stephanie@clipclopworkshop.comfor more information. Stephanie can be commissioned to do custom artwork including portraits of people, animals, homes or whatever your imagination can devise. She can do custom art as you as a pixie, fairy (faery) or mermaid too! Did you ever want to see yourself as a manga or anime character? Stephanie will do that! She can be commissioned to create a magical portrait of you! 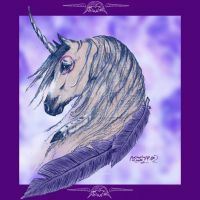 Stephanie creates art that features unicorns, mermaids, dragons, griffons and whatever fits her fancy. She can create cute, custom art for you that can be placed on a variety of Zazzle products such as Tshirts, blankets and more. Are you wanting your pet or child drawn? Want their picture on a blanket? Email Stephanie@clipclopworkshop.com for details. Stephanie Small is an artist located in California but she has spent time all over Oregon. Nature is an influential inspiration to Stephanie, as she seeks to augment and reflect what she sees around her in a variety of mediums. Inspired by medieval art, the fantasy and science fiction genre and more, Stephanie has developed a style of mythical realism. Stephanie uses a variety of styles and mixed mediums in her artwork. She regularly uses digital mediums such as Photoshop, Illustrator, Painter and more. She favors traditional mediums such as colored pencil, chalk, pen, ink, pencil, acrylic, watercolor. She has been known to adapt fabric, recycled art, recycled purses to create art that is both useful and stylish. Stephanie has been interviewed and featured in several magazines and websites. Her artwork has been published several times in books and magazines. She is best known for artwork featured in publications such as the Page, the Twisted Vine, the Unicorn and others. Her artwork will be featured on the cover of several upcoming books and publications. She often donates teaching, administrative assistance, research and artwork to many local non-profits. She has taught in-person and online classes on food preservation, writing, gardening, spirituality, unicorns, art and more. She has worked for (and with) the local government to initiate youth projects, senior events and business support. Stephanie loves unicorns and the horses she grew up with. It is clear in her art. She also loves mermaids. She even has a set of mermaid fins she can swim in. Stephanie Small finds inspiration in the animals of the ocean such as whales, orcas, narwhals and dolphins. Whether you are looking for a gift for girls, boys, men or women or whatever someone identify with, you will find something for everyone. 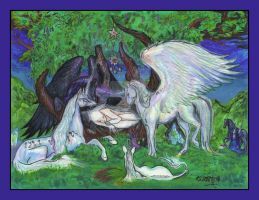 Powerful images which have themes such as cute, goth, fantasy, wild animals, patterns, geometric designs, sacred symbols, pentagrams, realistic or more can all be commissioned and area available in current gallery images. Her products have been featured in pagan groups and wicca organizations. She embraces a variety of colors, favoring jewel tones (red, blue, green, purple) as well as more outgoing colors such as orange, yellow, pink, teal, green, violet or lavender, white and more. She provides many steampunk, medieval fantasy, black and gothic or cute anime and manga themed products. She is in the Society for Creative Anachronism ( SCA ) and is a member of the Vallejo Oddfellows as well as other non-profits. She has a veterinary assisting certificate which helps her by giving her a thorough education in anatomy and the natural world. She can also create images that recreate an emotion or event such as happy, sad, depression, love, joy, exhilaration, congratulations, birthday, holiday, Christmas, Halloween, Yule, Easter, Ostara, and whatever other holiday or celebration you can think of! You can purchase her merchandise from Clip Clop Workshop her website. If you are looking for a personalized gift, look no further! These unique and stunning pieces of work are available in a variety of pieces and many can be customized to your preference. Are you expecting? She has a bunch of great baby gifts available. You can find personalized wedding gifts, Christmas presents and stuff for him and for her! Looking for something for kids, well this art is geared to making them squeal with joy! You can find a variety of personalized birthday gifts, photo gifts and products that appeal to anyone! Stephanie has provided high end and unique quality items, as well as some more inexpensive and cheap items to fill stockings! Visit her Store! Many of her pieces are cute and fun. She loves to paint her pictures using a variety of colors, she often blends them together. Highlight of contrasting hues augment a variety of her pieces. Whether your favorite color is red, blue, yellow, pink, green, brown, orange, black or white, there is an image that will fit into your home and apparel desires. Stephanie has prepared a variety of images suitable for any occasion. You can explore her Zazzle page to find pillows, blankets, T-shirts, wooden gift boxes, necklaces, jewelry and clothing. These are available for birthday, Christmas, Yule, Easter, Ostara, Thanksgiving, Halloween, Veteran's Day, Solstices, Equinoxes, Eclipses and other holidays. Gift Ideas for all ages: and greeting cards too! Horses, Ponies, Pegasus, Unicorns, Zebras, Donkeys and Other Equines: T-Shirts, clothes and more! I like his shading, nicely done! You can have one no problem!